It was a beautiful day and one of relative calm to walk the labyrinth as a group. We had a painted design outdoors and a canvas labyrinth we had intended to use indoors. With the warmth and call of nature, we opted to move outdoors with intention to walk the labyrinth noting and answering the questions that were affixed to the borders with Post It Notes along the path. As we independently found our answers, we wrote them out in brevity each on a separate post it note and stuck it to the path border where ever we happened to be in the moment of realization. As our walk progressed, post it notes created our borders with questions and answers. When all had completed we took another walk and found how interestingly enough the answers to a previous question found themselves situated with a different question. It was a wonderful way to appreciate the value of questions and answers and afterwards in our sharing circle, the conversation grew rich in the discussion about how are questions become our answers and how the answers created questions. 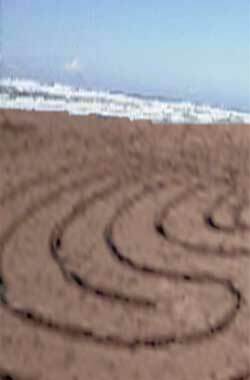 In the midst of our communication, a gust of heavy wind stirred up from the otherwise calm day and this unexpected force blew the post it notes into the air and off the painted lines of the labyrinth. It was as if our questions and answers had come to life, reinforcing our conversation to dance in the sky together as they uplifted with the wind into a recycled purpose. It furthered our appreciation for the walk, the sharing and the messages that came. We couldn’t have planned a better ending or perspective. We had an article to write and had written many before, though today all were very stumped. Suggesting a walk on the labyrinth nearby, most decided to go and as it was a group project, it would have been nice to have all join us, though we were content with letting all have their say and find their way. Those that joined were glad to be outdoors and felt a sense of resilience in being in step with both nature and themselves. As we began we were feeling a little free and a little goofy, though the awkwardness of the intimacy we were creating soon relaxed as everyone found their individuality and set aside any thoughts of what the other might think. We settled into our own experience and our own relationship with the slump in the collective creativity that was typically available with this group. For myself, I relaxed and stopped asking why. Instead any thoughts of force fell away and surrendered to curiosity. What I came to consider dropped off and my focus became of my feet, my steps and the outside air. As I walked I grew in a confident knowing way to simply appreciate many things. That we took the moment to consider the group’s need, the purpose of our prose, the point of our group and the individuality and characteristics of those who came together to accomplish something similar. The walk became about so many singular pieces that what was numb became alive and each piece seemed to find its importance in the whole. It was a walk of unification and our collective knowing seemed to show up again in everyone as we found ourselves much more communicative and creative in discussion afterwards. Accomplishment wasn’t just something we did, it was something we felt.